I headed up to Burlington, CT on Sunday to drop off some trail tools with the CT NEMBA Regional Trails Rep for the Nassahegan State Forest. We met at Lamson Corners off of Rt 69. Apparently, the regular riders of the Nassahegan are known as Nassa'ricans contrasting to those who ride offroad motorcycles and ATVs here, all illegally of course, are called the Hessians, famed German mercenaries from the Revolutionary war. Later during the ride we just missed encountering one of these bastards. Mark led me on a 10 mile tour starting from the Cemetery Twisties, up Stony Hill Road to the Kitchen Bypass. 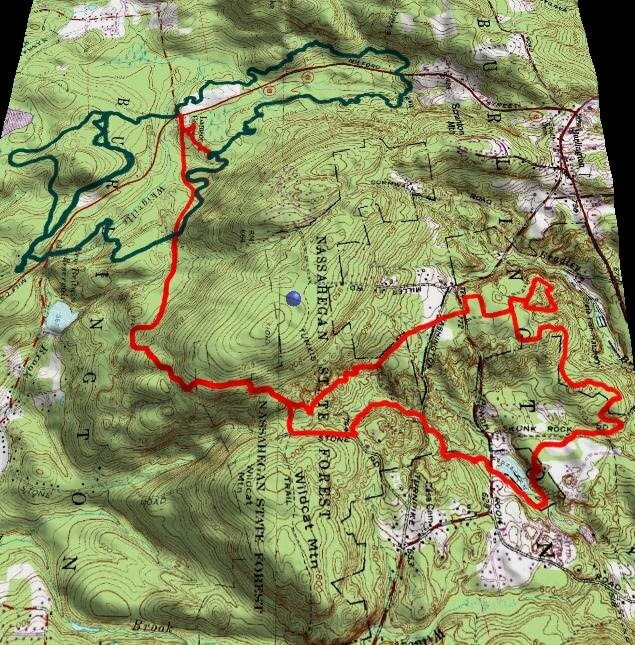 There is another trail nearby called the Devil's Kitchen which is insanely technical, fall line climb. We were doing quite a bit of climbing on the Kitchen Bypass and I was cursing myself for not putting on the 22t. From there, we picked up a trail called Rob Halford named by an atypical mountain biker from Bristol. Along this trail we came across where a turkey hunter got lucky on opening day. Eventually we got to the Soccer Fields and crossed over George Washington Turnpike. 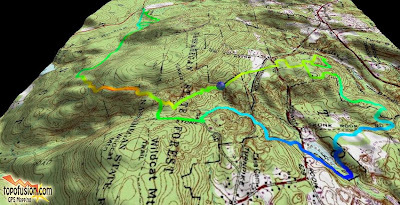 On the other side of the Turnpike is a dense pine forest with a big mix of fast dual track and winding, flowy singletrack. 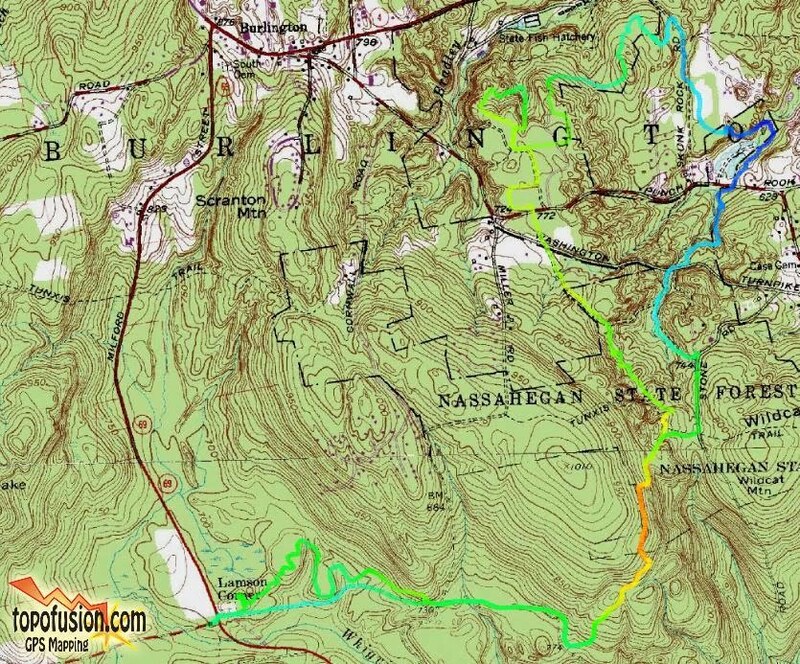 Some super, long assed climbs, and some really crazy descents. We rode by the Burlington Trout Hatchery and then crossed over Punch Brook Road on our way back to Lamson. At the seven mile point we stopped for some Gu and that's when we really started to notice the heat. By this time it had to be nearing 90 degrees but you didn't feel it because you were in the shade of the forest most of the time. From here we popped onto a dirt road called Stone Road where we passed this old jailhouse on the side of the road. According to Mark, during the Great Depression there were transient camps set up in the area and if one of the inhabitants went on a bender they wound up here to sleep it off. 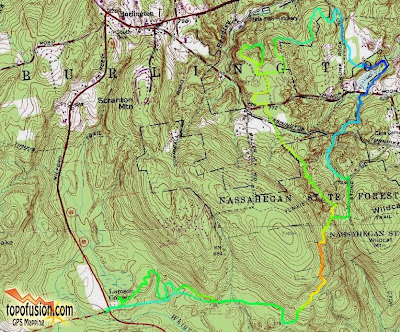 We continued down this dirt road until we picked up another trail that took use to the impassable section of George Washington Turnpike and while heading back towards the Kitchen we heard a Hessian and saw evidence of his recent travels on the trail. 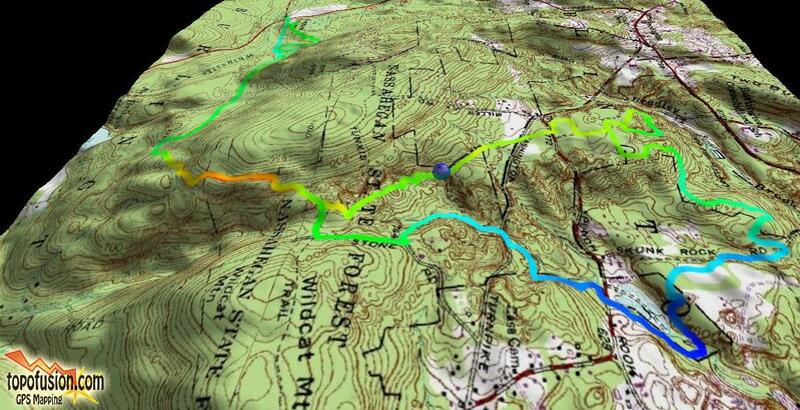 What initially was supposed to be a two hour jaunt in the woods turned out to be more like 3 hours and 10 miles. By the time we got back to the cars, it was pretty damn hot, when I got home the thermometer red 91 degrees and it's only the second day of May! I noticed something while riding in the heat and that was my heart rate tended to stay higher and came down slower. Something to think about if I am going to race in warmer weather, especially if I do the Landmine. I don't think my gearing choice helped much either. 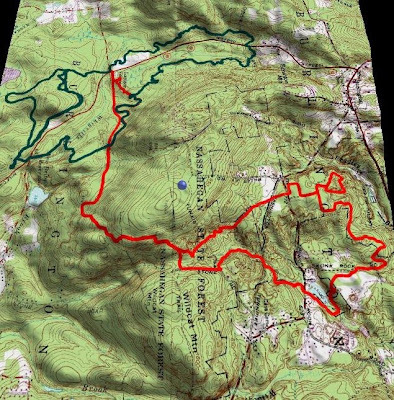 Above is a 3d representation of today's ride (in red) and the ride we did last fall to give you a sense of the enormity of the Nassahegan State Forest. Apparently, there are 50+ miles of trails here and I have only scratched the surface. Can't wait to come back for more fun.